This is a pair of the iconic two tier lamp tables from Lane’s Acclaim Collection. 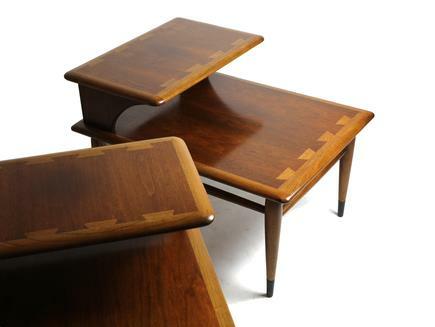 Along with the 900-01 rectangular cocktail table, these are the signature pieces of America’s most collected furniture group. Excellent original condition, with age appropriate wear. These tables show especially nicely. We are recognized as a national authority on the Acclaim Collection. For an review of the collection and an index to the wide variety of styles that Andre Bus designed for the line, please visit our overview page at our main Acclaim page.